As most everyone knows by now, Angel Cabrera made a 9 on the 17th at TPC Sawgrass and later withdrew from the Players Championship for “personal reasons.” There’s been a lot of speculation in the blogosphere that those personal reasons were mostly “I made a 9 on a par 3 hole,” but I’m going to cut Cabrera some slack on this. I’ve spent too many years playing golf and sitting in the psychotherapist’s chair to bang on him too hard. As a therapist, I was consistently amazed at how many personal difficulties many of my patients dealt with while they carried on a very successful life. No one suspected what was going on in their personal life, and they wanted it that way. Every now and then the problems would leak through, sometimes for only a minute or so, there would be a brief performance glitch. 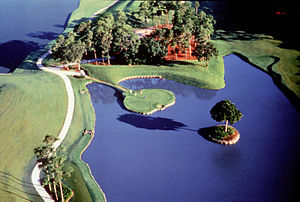 Assuming Cabrera had something else bugging him, the 17th at Sawgrass could certainly bring it out. As a golfer, I’ve had plenty of experience with having distractions from even minor problems really screw up my game. Maybe I’m too much a creature of habit, but golf is a game of routines and concentration, and it doesn’t take a lot to mess things up. Several years ago I was playing in our club championship. I typically don’t play on weekends because of my schedule, but I’d rearranged everything so I could play that Saturday and Sunday. Some things got done, some didn’t, and those undone things were nagging at me. At the time my handicap was varying between 7 and 8, and I was occasionally popping out some pretty good rounds. I felt like my game was good to go. I hit a bad drive on the first hole, but managed to save a bogey. After a drive into the trees on the next hole I hacked it to a solid 9, and by the time I finished the first nine holes I was so far over par that the rest of the tournament was unimportant. I finished the first day with a 91. I came back the second day and played just to hang out with the guys. I considered withdrawing, but learned that the other screw-ups in the championship flight were guys I liked to play with, so I would have a congenial group on Sunday. Besides, I figured things couldn’t be any worse than on Saturday. Cabrera wasn’t playing for fun. I bet he couldn’t look at his next day as a nice game with the guys, and it was highly unlikely he’d make the cut. What would you have done in his circumstances? And my second day? I was wrong. It could get worse. I shot 92. This entry was posted in PGA Tour, reflections on golf and tagged Ángel Cabrera, mental game, Players Championship. Bookmark the permalink.